“I cast my lot with those who do not understand the way God is able to foresee future free acts. The Bible makes it quite clear that God does possess foreknowledge of all future events, including free acts” (Dr. F. Leroy Forlines, Classical Arminianism: A Theology of Salvation. Nashville: Randall House, 2011, page 75). I had a conversation with a friend yesterday afternoon about a friend of ours who has been struggling through issues of theology. This mutual friend and I met once some months ago, to discuss how predestination and election work in salvation. She assumed (at the time) that one could be a godless person and still be “chosen” by God, without regard to genuineness of heart or anything else. At the time, she told me that if that’s how God does things, He was unfair to do so. After all, “Wouldn’t God want someone who had a broken spirit and a contrite heart?” she said. I began to show her that passages such as Ephesians 1 and Romans 8 refer to believers, those who have believed, not the world in general. Thus, God predestining believers poses no problems for me at least, since it is believers “in Christ” who are chosen before the foundation of the world (Eph. 1:4). I do not struggle with the predestinarian and electing language of the Scriptures...so I try to pass on my God-given knowledge to others. Well, in this post, I’m gonna spend some time talking about mystery. I rarely do. Here at the Center for Theological Studies, you will rarely find me saying that anything is a “mystery.” I rarely use that word because I think it is too often used to escape the God-given human responsibility believers have to come to know our theology. We should know the deep things of God because we should study. And when the Lord commanded people to follow Him, He did not say, “Follow me if you have a couple of degrees and can speak some of the biblical languages”; instead, He commanded all to follow Him, whether literate or illiterate, rich or poor, famous or infamous. Every believer should be a disciple of Christ...and every believer should desire to study so as to learn more about the Christ he or she is following. In the quote above, Dr. F. Leroy Forlines states that he does not know how God foreknows future free acts. In Molinism, such “mystery” is labeled “the grounding objection.” The grounding objection is one of the most often-used attacks against Molinism. I rarely use it much to oppose Molinism...but that’s because I think, more important than the grounding objection, is the theology behind the system itself. I analyze Molinism based on its five points and whether or not I can see them in Scripture. Dr. Forlines openly admits that the Bible teaches human free acts and divine foreknowledge...but does not tell us how God foreknows what He foreknows. At the very least, we are to confirm what Scripture teaches, even if all the philosophical underpinnings are not made clear to us on earth. God demands that we understand Him as three persons (Father, Son, Holy Spirit), even though we may grapple with how the Trinity operates. There are many things in theology that we must admit we do not have all the answers to. “I believe God’s foreknowledge of free acts is also necessarily implied from God’s foreknowledge of His own actions. It would have been impossible for God to have had foreknowledge of sending Jesus Christ into the world apart from knowledge of the free acts of human beings, that is, unless a person takes the position of unlimited determinism. For God to have had foreknowledge of the exact identity of the human nature of Jesus Christ required that He have foreknowledge of His exact ancestry. For God to have this knowledge required that He have a foreknowledge of free acts of human beings” (Forlines, Classical Arminianism, 75). Dr. Forlines’ statement about God sending Jesus into the world foreknowing the actions of human beings sounds very much like Peter’s statement in Acts 2:23---the Jews put Jesus to death, but this was done by the “foreknowledge and predetermination of God.” God, foreknowing the sin of Adam and Eve, as well as the actions of Judas, Pilate, the nation of Israel, etc., determined in eternity to send Jesus to redeem humanity back to Himself. But make no mistake: Not at any time did the Father ever think the plan was going to fail. Why? Because He foreknows all things! If Jesus foreknew of the Sanhedrin’s decision to sentence Him to death, His condemnation and crucifixion (Matt. 16:21; 17:22; 20:17; Mark 8:31; 9:30; 10:32; Luke 9:21, 43; 18:31; John 12:27), then the Father foreknows all things as well. 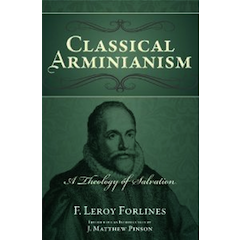 “I do not understand the mode in which He foreknows future contingencies, and especially those which belong to the free-will of creatures, and which He has decreed to permit, but do not of Himself” (James Arminius, quoted by F. Leroy Forlines, Classical Arminianism, page 74). Believers can never know (without God’s unique revelation) how the Lord foreknows future human actions, but we can all affirm that we know God foreknows them. The Bible’s sufficiency is seen in the fact that we have what we need to know: that is, that God foreknows our actions before we ever think of committing them. How God knows is something that remains hidden in the counsel of God. We can speculate, attempt to probe with the biblical text we have, but speculation will always lead to more debate---since we must admit our limited, finite knowledge in such matters. What we can affirm with certainty is that God exhaustively foreknows all things, down to the smallest details. This post has shown that there are some discussions within theology and philosophy where the answer is “unknown,” remains a mystery; nevertheless, there are many things about theology and philosophy (via the Scriptures) that can be known. To caution believers, I would give this advice: if you find yourself plugging the word “mystery” onto every debate that you’ve not read on and researched yourself, chances are you’re probably neglecting your God-given responsibility to sort through it. Even if, after much study and research one still cannot find the missing pieces to the puzzle, at least you can say that you’ve searched out the Scriptures and theology. What harm is done if, after all your pursuit, you still end up empty? Have you not pleased God with your diligence?